My co-workers told me about Artichoke Pizza, but I only half believed them. "It's the best pizza you're EVER going to taste." I didn't know if I'd completely agree, but my curiosity was piqued to the max, especially when my co-worker Meghan talked about their most coveted "artichoke" slice with a creamy cheese topping and soft artichokes. "Mmmmm," I was intrigued and ventured over there one day after work. I was duly warned about Artichoke's famous (and painfully long) line. "It's always like that," Meghan said but I thought to myself that there must be a good reason. This place must really be something special if there's always a line. Sure enough when I got there, I noticed the line forming out the door. It seemed to be moving slowly but if you prepare yourself for this, you'll get through it. In the midst of my wait, I got to scope out the scene and figure out where to eat my pizza, as there was no seating inside - the space is absolutely tiny. Spotting some wooden benches outside (and it was a nice, mild night) as well as a wooden make-shift bar, I knew where I'd be scarfing down my artichoke slice. While people sat on the benches, no one used the make-shift bar, so I'd highly suggest that if you want some "privacy." 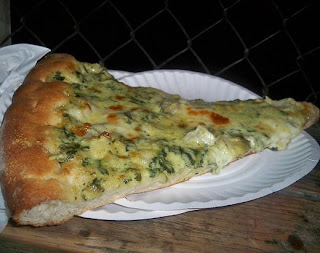 Oh my holy god, once it was actually my turn and I got to order the signature artichoke--and get this, a spinach combo--slice I was ready for my experience to start. First off, the slice was absolutely humongous and could've very well been the equivalent to a half loaf of bread. I knew I had to pace myself and know when to stop or I'd get grossly, utterly full. Putting my slice on the "bar" I could hardly wait for it to cool down. Waiting for about 5 seconds, I couldn't take it anymore and took a big bite, burning the roof of my mouth in the process. It didn't matter. Oh sweet mother of pizza - the flavor was beautiful. From ingredients to texture and apperance, this slice had it all. Each bite produced the most luxurious sensation in your mouth - the soft (almost saucy) cheese melded together with the artichoke and the spinach, forming perfect harmony. 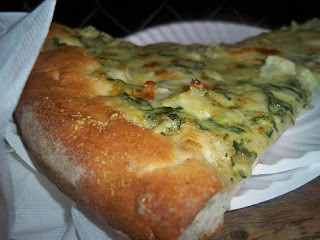 It tasted like you were eating the most delicious artichoke/spinach dip on the freshest pizza dough ever. Another fabulous component was the excellent quality olive oil that was used - you could taste the freshness and fruity flavor. I don't know where they get this stuff, but it's for real. I wouldn't be surprised if I found out it's imported from Italy. Magnifico! There are three guys in the shop and they are busy. Two guys make the pizza and one guy tends to all customers. That's right, one guy. He's nice and jovial under the crazy circumstances and does a good job at managing the crowds. He didn't seem stressed, which was admirable - I guess he's used to the hubbub. This is definitely one of the best slices in the city! Glad you finally experienced it. OMG, it rules! I can't wait to have it again. I dream of Artichoke.